Place apples in large bowl, and pour the cinnamon sugar mixture over apples. Stir until all apples are evenly coated. Spray 4- to 5-quart slow cooker with cooking spray. 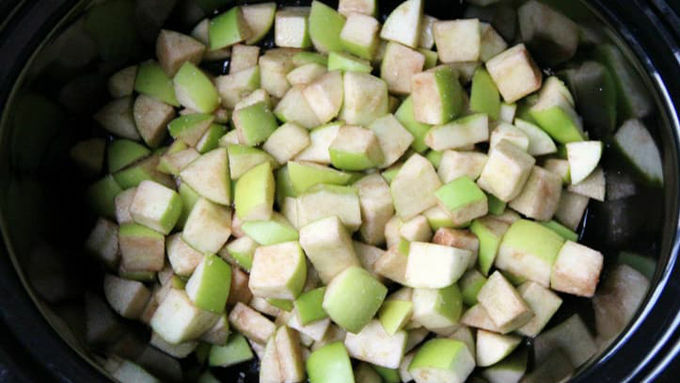 Place apple mixture into slow cooker. In large bowl, mix all Topping ingredients except butter. Stir until well combined. Place butter pieces on top. 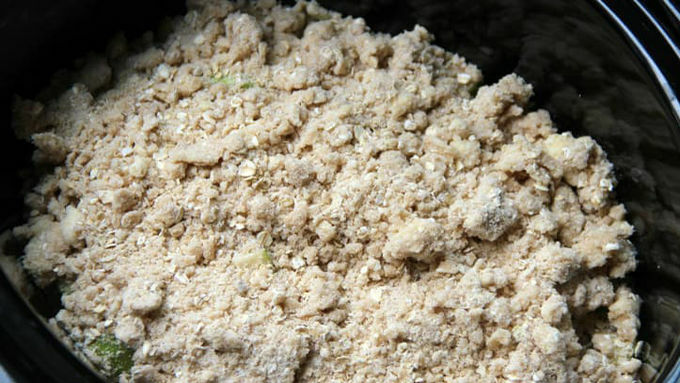 Using fork or pastry blender, cut cold butter into mixture until crumbly. 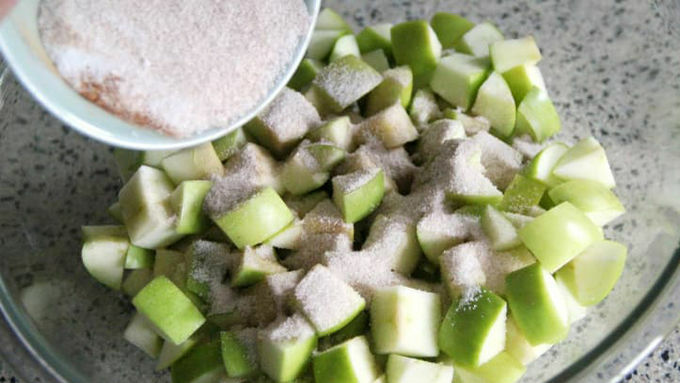 Sprinkle over apple mixture. Cover and cook on High heat setting 3 hours. My favorite apples for this recipe are Granny Smith, Braeburn or Fuji apples. 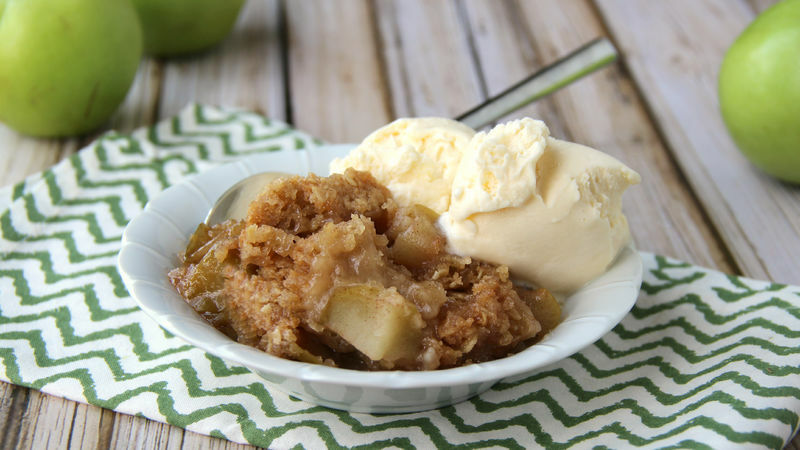 For an extra-special treat, try drizzling caramel sauce over your Slow-Cooker Apple Crisp. Nothing says fall like apple crisp and nothing says party like scarce oven space, which is why we love this slow-cooker apple crisp recipe on game day, Thanksgiving and other times when we’ve got a full house. The other reasons we love making this recipe for a crowd is because it’s quick and easy — the most time consuming part of putting it all together is peeling and slicing the apples. But as they say, many hands make light work, so gather your helpers and go it done. Before you know it, your apples will be prepped and your crisp will be tucked into your slow cooker, which means there’s time to focus on other things, like your guests! For more recipes that’ll make the most of your apple haul, peruse the rest of Betty’s crisp and cobbler recipes. And if you really want to impress, take a look at this step-by-step guide to baking the best apple crisp.